The word gold, used alone, means all gold or 24 karat (24K) gold. Because 24K gold is soft, it’s usually mixed with other metals to increase its hardness and durability. If a piece of jewelry is not 24 karat gold, the karat quality should accompany any claim that the item is gold. The karat quality marking tells you what proportion of gold is mixed with the other metals. Fourteen-karat (14K) jewelry contains 14 parts of gold, mixed in throughout with 10 parts of base metal. The higher the karat rating, the higher the proportion of gold in the piece of jewelry. Most jewelry is marked with its karat quality, although marking is not required by law. Near the karat quality mark, you should see the name or the U.S. registered trademark of the company that will stand behind the mark. The trademark may be in the form of a name, symbol or initials. If you don’t see a trademark accompanying a quality mark on a piece of jewelry, look for another piece. Platinum is a precious metal that actually costs more than gold. It is durable, and often chosen for its ability to show off the brilliance of the gem it holds. It usually is mixed with other similar metals, known as the platinum group metals: iridium, palladium, ruthenium, rhodium and osmium. 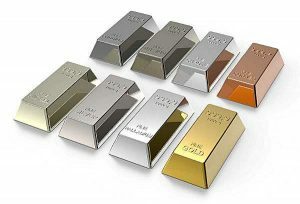 Different markings are used on platinum jewelry as compared with gold jewelry, based on the amount of pure platinum in the piece. The quality markings for platinum are based on parts per thousand. For example, the marking 900 Platinum means that 900 parts out of 1000 are pure platinum, or in other words, the item is 90% platinum and 10% other metals. The abbreviations for platinum – Plat. or Pt. – also can be used in marking jewelry. Palladium is a rare silver-white metal that is a member of the platinum family. Palladium is harder than platinum. It is also generally whiter and lighter in weight than platinum. The metal is hypoallergenic and tarnish-resistant. Many people who enjoy the look of platinum or white gold find that palladium is another excellent choice for their jewelry. Tungsten Carbide is an extremely hard metal that is also scratch-resistant, making it an excellent choice for jewelry that is worn everyday. It is silver-white in color and lustrous. Tungsten Carbide is commonly used in wedding bands. The words silver or sterling silver describe a product that contains 92.5% silver. Silver products sometimes may be marked 925 which means that 925 parts per thousand are pure silver. Some jewelry may be described as silver plate: a layer of silver is bonded to a base metal. The mark coin silver is used for compounds that contain 90% silver. According to the law, quality-marked silver also must bear the name or a U.S. registered trademark of the company or person that will stand behind the mark.